WTF Are You Reading? : Audio Awesomeness: There is Nothing Halfway About "Halfway To The Grave"
Audio Awesomeness: There is Nothing Halfway About "Halfway To The Grave"
Have you ever seen series EVERYWHERE, but for some strange reason never got around to reading it. 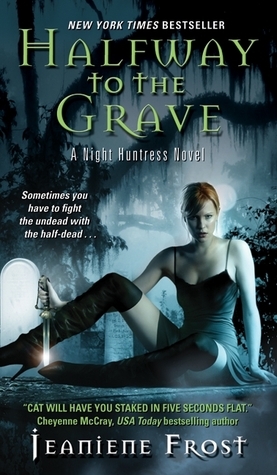 That has been the case with this reviewer and the Night Huntress series. After reading this, the first book in the saga; this is now a new love and forever favorite on my reading list. Catherine takes a little getting used to. She is not only a tortured soul, but also very sheltered and naive. The juxtaposition of these qualities against her vigilante vampire hunter persona Cat, presents quite the puzzle and makes plenty of room for the growth that or young heroine experiences as her story unfolds. Things really start to get interesting with the introduction of master vampire "Bones". After she tries and fails to kill him; a bargin is struck that changes their lives forever. She agrees to work for him as a vamp bounty hunter and he steals her heart. This book has everything. There is mystery, action, romance,murder,humor and suspense. By the end of the book; Cat is very secure in who she is and very much in love. Due to some very WTF occurrences and plot twists that you have to read to believe; readers are left with a truly heart breaking end. is flawless whether the characters be male or female. This is such an awesome series! I need to pick this series up too! >_< Your review got me excited about reading it! I listened to this audiobook, too! Tavia had me laughing outloud. Her comedic timing is priceless and her British accent is spot on! I love love love this series!! I completely agree with this review! I read this as an ebook a year ago and I've been hooked in this series ever since. Might consider hearing the audiobook, I'm sure it would be worth it. But I didn't listen to it, will have to check the audiobook. I love this series. Cat and Bones are such a great couple and the books are funny too.